Both Czar and Cara have now left for their new homes, and both have made successful show debuts. I hope to see lots more of these little darlings. More photos - just because I can! Czar and Cara were having great fun whizzing up and down the stairs this afternoon, then stopping for little-cat-naps in the sun. Czar and Cara are both doing fantastically well, growing at an amazing rate and greatly enjoying prolonged games with feathery toys, rattly balls and anything else they can get their elegant little paws on! I've been totally useless about updating my kitten pages, but my excuse is that I've been too busy playing with them and kissing their cute, pudgy tummies to write about them! Three weeks old, these babies are as big as Zach and Ziva were at the same age ie HUGE, with the girl weighing in at almost 1lb, and the boy being well over that. I really don't know how little Yzzy manages it! She is greatly enjoying being a mother again, and has me wound round her delicate little paw as usual. I suspect her kittens may have inherited that ability from their mum too! 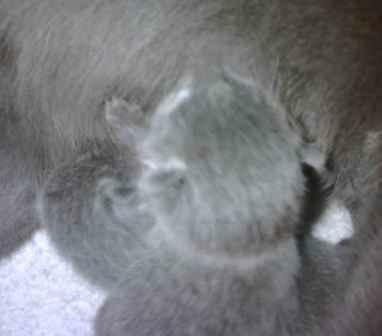 Now a fortnight old, toddling around and play-fighting quite the thing, Yzzy's kittens are totally adorable! 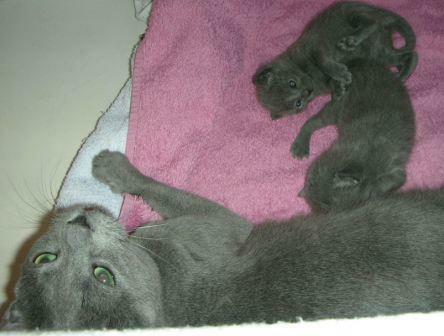 Yzzy's babies are now one week old and, as with her first litter of kittens, have been absolutely piling on the weight, having more than doubled their weight since they were born! Their eyes are open and they are surveying the world with an adorable air of bewilderment. Congratulations to my clever little Yzzykins on her two beautiful babies - a boy and a girl. One is provisionally booked already! The long wait is nearly at an end - Yzzy is happily nesting, purring, demanding loads and loads of tummy rubs, and being generally adorable. Dad-to-be Pumpkin, Grand Champion Sithee Buttercup Joe, is an absolute softy too, so here's to equally adorable kittens!